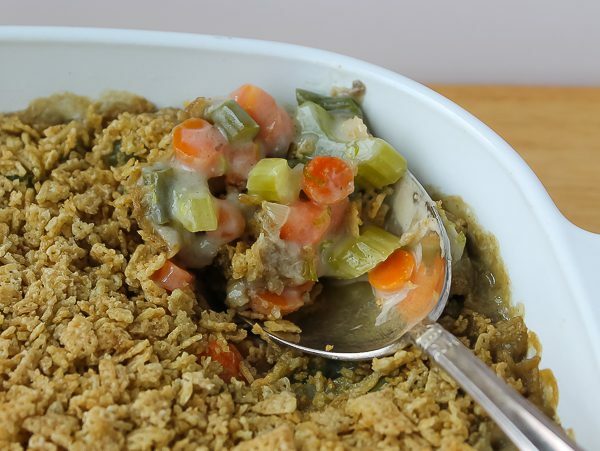 I think just about everyone in the USA knows of this legendary casserole, and millions have graced it on their Thanksgiving tables since 1955. 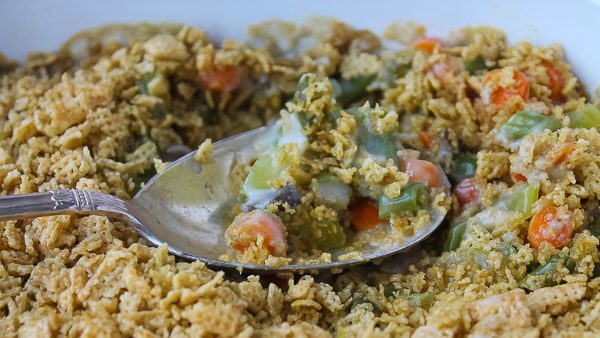 Campbell Soup officials say the Green Bean Casserole is the most popular recipe to ever be developed in their corporate test kitchens. The recipe’s website is expected to receive about 20 million hits during the upcoming holidays. The original recipe card was donated to the National Inventors Hall of Fame in 2002. The inventor of the casserole, originally called “Green Bean Bake,” was Dorcas Reilly, a Campbell Soup kitchen supervisor. In 1955, Reilly came up the recipe for an Associated Press feature, and the rest is history. She also created a tomato soup meatloaf, a tuna noodle casserole, and Sloppy Joe-like “Souperburgers.” Reilly says she always kept the ingredients for the Green Bean Casserole on hand in her home, just in case someone asked her to make one. 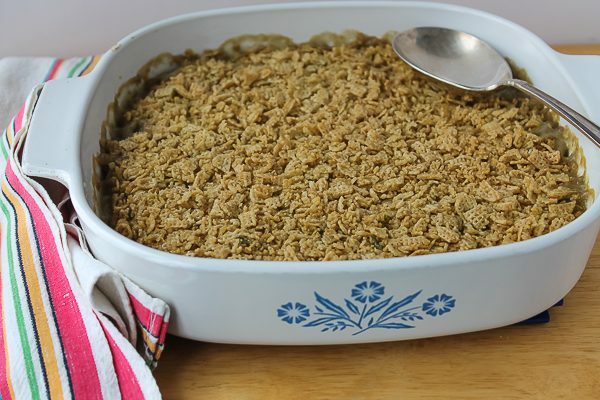 Whenever recipe contests over the years were held using Campbell soups as a required ingredient, Reilly said versions of the Green Bean Casserole would pop up in many entries. The original recipe is still a fixture on the soup can labels and seen on commercials. Dorcas Reilly passed away last month at the age of ninety-two. 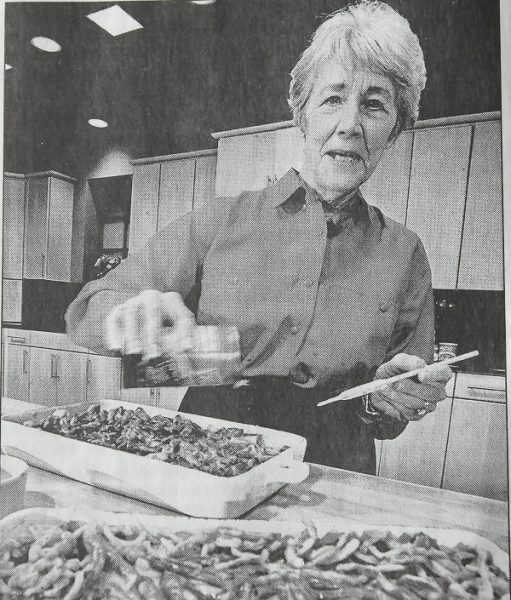 Campbell’s describes her as “an incredible woman whose legacy will live on, and she will be missed by her colleagues and all those who were impacted by her creativity and generous spirit.” Reilly worked for Campbell’s on and off between the late 1940’s to 1988 when she retired as the manager of Campbell test kitchens. 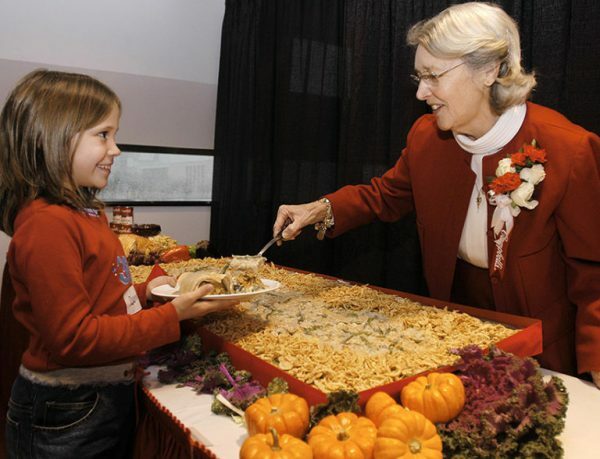 Countless Americans will enjoy the Green Bean Casserole (or its many versions) this week. If you are making it, take a second to thank Dorcas for her legendary dish and a place in food history. I grew up with one of the versions of the original casserole. I don’t know where my mom found this recipe, but if it did not appear on our Thanksgiving table, there would be a family riot. My guess is, mom made this version because some family members did not like the canned fried onions. Instead the recipe calls for crushed Rice Chex cereal mixed with ground thyme and butter. It also uses not only green beans, but also celery and carrots, and of course, the Cream of Mushroom Soup. It has the same “feel” of the original casserole. This will be our first Thanksgiving without mom. I’m sure there will be tears by family members who will be making her version. It will always make us think of mom. My mom's version of the iconic Green Bean Casserole. Heat oven to 350 degrees F. Butter a 2-quart square casserole dish; set aside. Place carrots, green beans, sliced celery, water, salt, pepper, and ¼ teaspoon of the ground thyme in a saucepan. Bring to a boil, reduce heat, and cook, covered, for 15 minutes over low heat. Reserve the liquid. Using a slotted spoon, scoop out vegetables and set aside in a bowl. Measure the liquid left in the pan, there should be about ½ cup. If you don't have ½ cup, add water to reach that amount. Stir the soup into the liquid in pan. Stir in reserved vegetables. In a small skillet, melt 2 Tablespoons of the butter. Add the chopped celery leaves and onion. Stir for about 4-5 minutes or until onions are clear. Stir into the saucepan with the soup and other vegetables. Mix well. Spoon vegetable-soup mixture into prepared casserole dish and spread out evenly; set aside. Crush the rice chex coarsely; set aside. Melt the remaining 2 Tablespoons butter in a large skillet. Add the crushed chex and remaining ¼ teaspoon ground thyme to skillet. Coat and stir the chex over low heat for 5 minutes. Sprinkle evenly on top of vegetables in casserole dish. Bake, uncovered, for 25-30 minutes until bubbly. Serves 8. Trader Joe’s is selling a “kit” to make a version of her famous green bean casserole this Thanksgiving. It’s in the fresh vegetable section–everything you need is in the package. You could probably add a package of their mire poix to make more like your version. Of course there would be more onion in it that what your recipe calls for, but as far as I’m concerned there is no such thing as too much onion–LOL ! Isn’t that 1 Tablespoon of chopped onion so funny? As with the fried canned onions, my guess is my mom changed the topping along with the amount of onion because someone in the family didn’t like a lot of onion either! I have never seen a kit for the casserole before. Thanks for the info, and I agree that the addition of the mire poix would make it more like mom’s version. Looks really delicious. Thank you for sharing and Happy Thanksgiving! Thank you, and Happy Thanksgiving to you too!